Deviant Stitches: How about a book review? 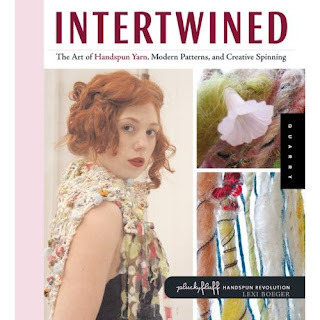 For my birthday I received a copy of Pluckyfluff's new book, Intertwined . I already own her self-published book, Handspun Revolution which I love. After experiencing the size of the first book, I was pleasantly surprised at the size of this one; Intertwined is over 300 pages of excellent freestyle spinning information. The book is filled with tons of great pictures and personal accounts from other spinners on the creations of their yarns. It includes over 30 projects made with art yarns and instructions on how to get the most out of the yarns you spin and how to knit for the yarn. My favorite part of the book so far is Chapter 2- Start to Finish: A Spinner's Journal. Three different spinners kept a journal of their yarn creations through the process of designing, spinning and creating a project from their handspun. My first "project" from this book is spinning fabric. I have a box of tour dresses that I can't seem to get rid of for sentimental reasons. I was planning on cutting them up and making them into something else, but I still haven't so I am going to look for some accents and dye some roving to go with one of them and see what kind of yarn I can get.